Gallery Wendi Norris is pleased to present the gallery’s first solo exhibition of new work by Los Angeles-based artist Helen Rebekah Garber. Garber is fascinated by the underlying geometric systems found in metaphysical imagery attributed to otherwise vastly different ancient and contemporary cultures. In her thickly layered oil paintings and hand drawn works on paper, she explores underlying mathematical relationships within aesthetic symbols. She elicits visual parallels between scientific notation and supernatural ritual documentation as metaphor for what is known and what is speculative across time, culture and place. In this exhibition, Garber will show a series of new large-scale paintings that are nearly monochromatic but for traces of subtle color that peak through layers of gray and white paint. Alongside the paintings, Garber will exhibit three diptychs, created in graphite and gouache on paper. 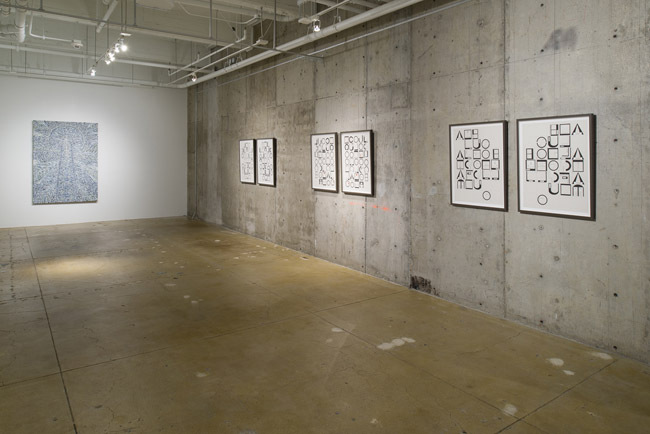 The subject matter is an indecipherable language constructed by the artist that references modernist fonts yet also appears as though it could mimic spacecraft circuitry. In each piece, the “letters” spell out lines from a different Walt Whitman poem relating to individual spiritual conquest. The shapes in the drawings are based on first a translation of a quote using Sir Thomas More’s utopian alphabet that was created in 1516 and employed in his book Utopia. Garber then converts these quotes into geometric symbols. Each panel of the diptychs is a mirror image of the other; they read visually as delicate pages of oversized manuscripts. Garber studies the intangible powers that many civilizations believe control the universe, including magnetic fields, energy fields (positive and negative), sonar, love, luck, religious fervor and subconscious internal drives. She explains, “Due to these powers’ intrinsic invisibility, different cultures find similar ways of translating these abstractions into communicable forms.” The characters and symbols that underpin her work are derived from these mystical yet eternal commonalities. Garber questions whether the areas of semblance between societies reveal intrinsic truths about human communication.